This is a step-by-step instruction on how to provide us with a full error report. We might ask you to do this when you are having problems with AxCrypt. The information we get by this will help us help you! A screen shot of the situation, error message or similar. The AxCrypt configuration files and internal error log. 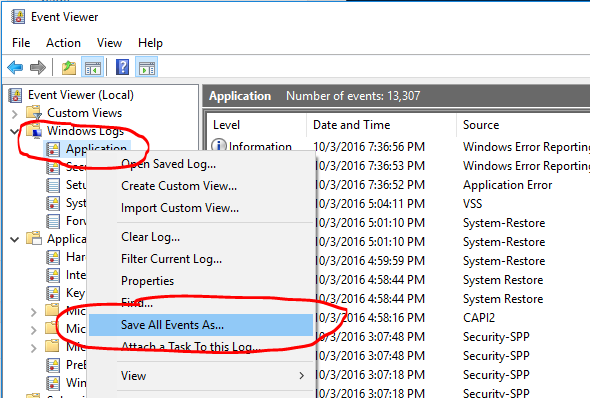 Your Windows Event Log. This is a log of all errors reported by Windows recently. A screen shot of the situation, i.e. ‘Problem.jpg’ or similar. 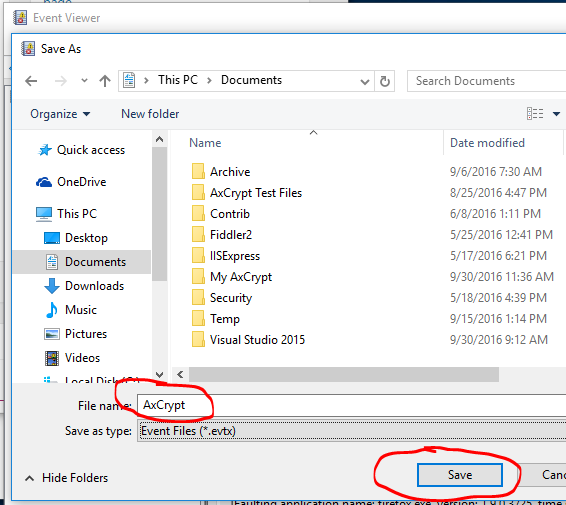 AxCrypt.zip – the zipped event viewer log. For detailed instructions, read on! 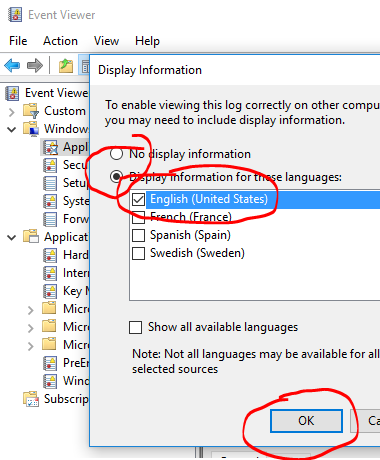 Please follow the instructions from Microsoft on how to use the Snipping Tool: https://support.microsoft.com/en-us/help/13776/windows-use-snipping-tool-to-capture-screenshots . Do not crop it too much, please show relevant parts of Windows Explorer and the full AxCrypt window where appropriate. Start by opening Windows Explorer, and enter the path to the AxCrypt configuration folder: %localappdata%\AxCrypt, then hit ‘Enter’. Take all files ending with .txt, and attach them to the mail. There is nothing especially sensitive in these files. You can always open them with a text editor to see exactly what is sent if you like. Do not add folders that you may see here. 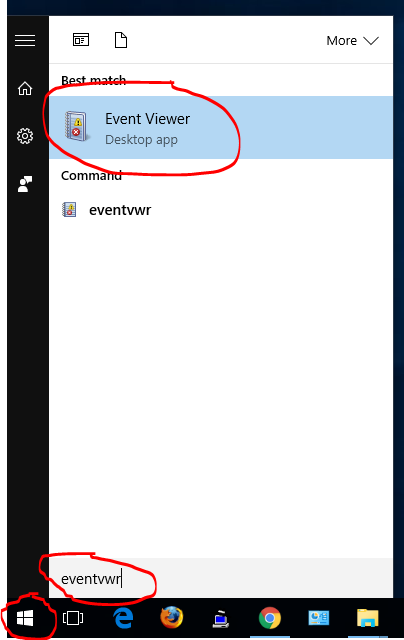 And then click on the “Event Viewer Desktop App” suggestion to start. Expand the Windows node, right-click the ‘Application’ node and select ‘Save All Events As…’. 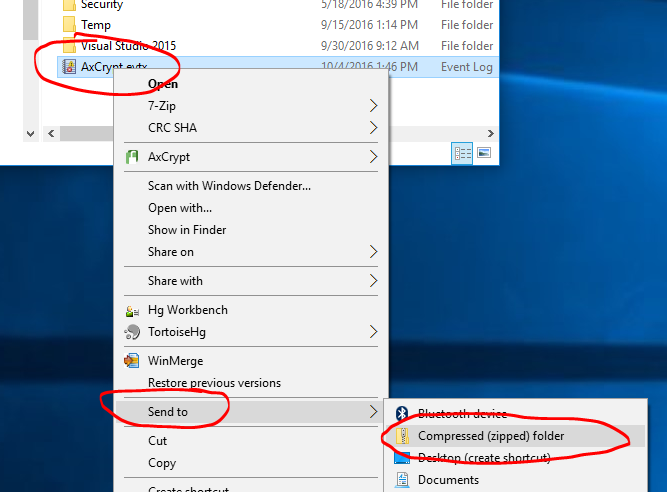 Save to ‘Documents’, and name the file ‘AxCrypt’.